There is seemingly nothing you cannot do or pair with rose gold. The alloy rose gold was created two centuries ago by the maker of Fabergé eggs and jeweller to czars, Carl Fabergé in Russia. He mixed gold and copper to form the new pink-tinted gold. In the 1920’s the famous jeweller, Cartier used rose gold for his Trinity Rings and again rose gold was very popular. 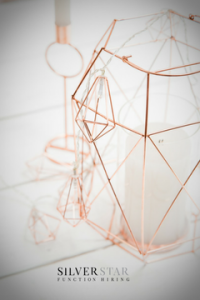 After the Pantone Colour Institute (https://www.pantone.com/) announced Rose Quartz will be the colour of 2016, popularity once again shot up and rose gold is now found in anything from phones, food and jewellery to homeware, make-up and of course décor. “It is very complimenting to marble and cream,” she says. “But it works just as well with soft pinks and peach. 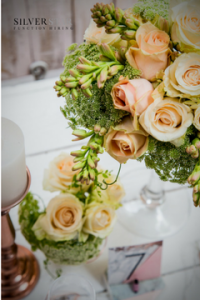 With the softer colours, you can do a more vintage feeling for something like a baby shower, christening or a corporate function that allows for a bit of spark. 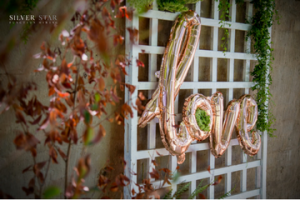 “Because we have such a wide range of rose gold décor items, we have the luxury of playing around with almost any colour scheme and arrangement to see what works best. 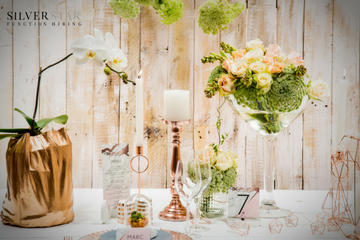 It takes an expert eye to ensure that the balance of rose gold used is pleasing to the eyes, it is quite easy to overdo and ruin the look. 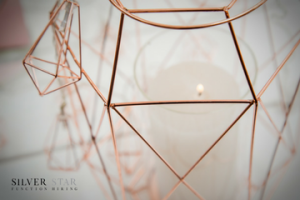 Another way to add to this trend, that’s by the way been spreading like a wildfire, is the use of rose gold geometrica – geometric designs – in all sizes incorporating flowers and candles to add to the elegance.